Christopher is well known for his performances as a cabaret magician. A 'cabaret show' is an act that is performed for a group of people watching together in a focused atmosphere. Sometimes this can be an after-dinner show or as part of a line up of other performances. The act is designed for 'salon style' performance conditions, up to 100 people; however it can be tailored to play to larger audiences as well. Imagine… a spectator's mind is read like a book, a signed banknote is burned to ashes and reappears on the other side of the room perfectly restored, a playing card visibly melts through a balloon! Christopher performs as cabaret magician in sitting rooms and prestigious venues throughout London and the UK. He has performed this act in Greece, Switzerland, Italy and the U.S.A. In his charming performance style and baritone voice - sometimes while performing to music, he leads his audiences through his theatre of the impossible. 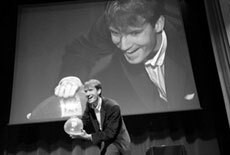 The act length can be adjusted to the needs of your event and often is presented as a finale to Christopher's performances as a close-up magician while guests arrive. Christopher Howell's cabaret show is an event that leaves people talking about it, we are told, for years to come. 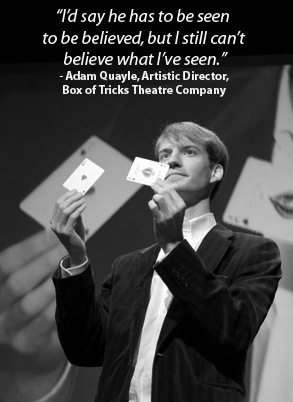 To see a sample in action, watch the cabaret magician video on the home page. Contact Christopher direct to tell him about your event. "He's not just any entertainer but the wonderful Christopher Howell." "I'd say he has to be seen to be believed but I still can't believe what I've seen." "The entertainment you provided helped set the scene for the evening and certainly got people, many of whom were meeting for the first time, talking and interacting with each other. The playing card melting through the balloon is definitely the one that had people talking most – I was still being asked on the second day if I knew how you had done it! Your performance and interaction with our people was exactly right for our event and helped give the overall event a greater kudos and enjoyment for all those that attended." "Your show was really thought-provoking and very funny, ... you presented it with great charm and humour... Every one of my guests has told me how much they enjoyed your input into the evening so thank you very much again for a most excellent evening's entertainment."